This photo - taken by a 23rd Infantry veteran - depicts the aid station at Heartbreak Ridge (Hill 931). Image online, courtesy Korean War Project. Of many casualties, stemming from a stalemate where neither side won appreciable ground, one event stands out. It was the battle for "Heartbreak Ridge," fought between September-October of 1951. The attack began on 13 September and quickly deteriorated into a familiar pattern. First, American aircraft, tanks, and artillery would pummel the ridge for hours on end, turning the already barren hillside into a cratered moonscape. Next, the 23d's infantrymen would clamber up the mountain's rocky slopes, taking out one enemy bunker after another by direct assault. 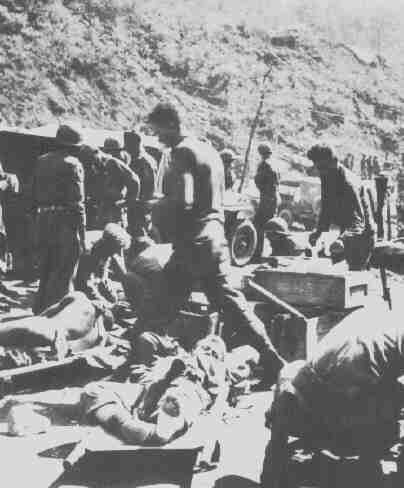 Those who survived to reach the crest arrived exhausted and low on ammunition. Then the inevitable counterattack would come - wave after wave of North Koreans determined to recapture the lost ground at any cost. Many of these counterattacks were conducted at night by fresh troops that the enemy was able to bring up under the shelter of neighboring hills. Battles begun by bomb, bullet, and shell were inevitably finished by grenade, trench knife, and fist as formal military engagements degenerated into desperate hand-to-hand brawls. Sometimes dawn broke to reveal the defenders still holding the mountaintop. Just as often, however, the enemy was able to overwhelm the tired and depleted Americans, tumbling the survivors back down the hill where, after a brief pause to rest, replenish ammunition, and absorb replacements, they would climb back up the ridge to repeat the process all over again. The battle progressed in the same manner, day and night, for two weeks. One after another, wearied units of men succumbed to the strain until "the 23rd Infantry as a whole was fairly well shattered." On September 27, the Division's new commander, Major General Robert N. Young, stopped the "fiasco" on Heartbreak Ridge. Temporarily. To hold Heartbreak Ridge, the Americans needed to cut off, and destroy, North Korea's reinforcements. They also needed a better road so they could effectively assault the ridge with Sherman tanks. Some of the soldiers, under enemy fire, dug an improved road, free of mines. By October 10, all was ready. A costly victory was about to begin. The sudden onslaught of a battalion of tanks racing up the valley took the enemy by surprise. By coincidence, the thrust came just when the Chinese 204th Division was moving up to relieve the North Koreans on Heartbreak. Caught in the open, the Chinese division suffered heavy casualties from the American tanks. For the next five days the Shermans roared up and down the Mundung-ni Valley, over-running supply dumps, mauling troop concentrations, and destroying approximately 350 bunkers on Heartbreak and in the surrounding hills and valleys. A smaller tank-infantry team scoured the Sat'ae- ri Valley east of the ridge, thereby completing the encirclement and eliminating any hope of reinforcement for the beleaguered North Koreans on Heartbreak. Before the fighting was over on October 13, when French soldiers captured the last Communist bastion on the ridge, thousands of men were dead or injured. The 2d Division, with its attached French battalion, suffered at least 3,700 casualties. The North Koreans and their Chinese supporters lost even more - an estimated 25,000 dead or injured. It wasn't just at Heartbreak Ridge where UN forces were fighting that summer and fall. By late October, UN operations had secured most of the "commanding ground along the length of the front." Holding that ground cost approximately 40,000 UN casualties. Because the United Nations Command had taken the offensive, refusing to back down, it was clear to North Korea and its allies that more losses would ensue if the fighting continued. Bos, Carole "HEARTBREAK RIDGE" AwesomeStories.com. Jun 01, 2008. Apr 18, 2019.